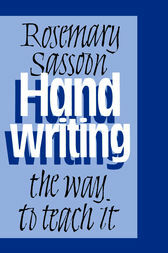 This book is an essential classroom guide to the teaching of handwriting. It covers all aspects of the subject: from whole-school planning, to classroom management and the teaching of letters in a highly illustrated and practical sequence; and from initial letter forms through to joined writing. The author presents many examples and imaginative ideas to make learning to write more effective and interesting for children and for teachers. This Second Edition includes material on problems which children can have with handwriting, and how to diagnose and remedy them. The author offers strategies for better teaching, and her aim throughout the book is to encourage flexibility and clear thinking about essential issues, rather than to impose solutions.